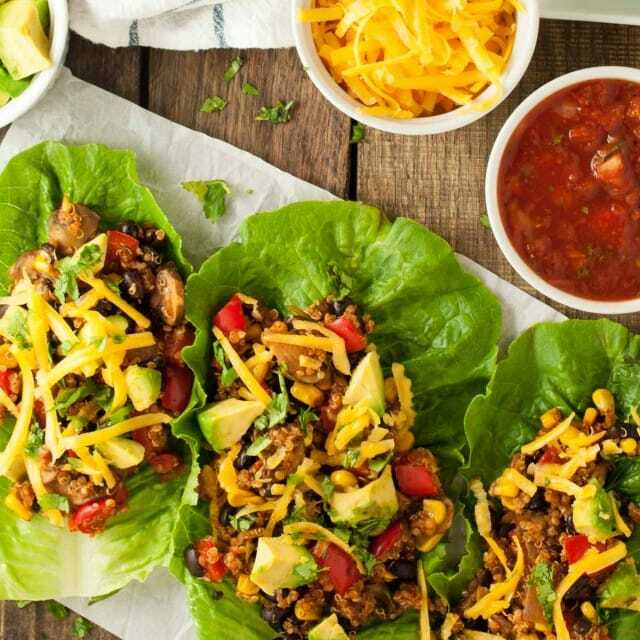 Taco vegetarian lettuce wraps with quinoa and black beans put a tasty spin on tacos that will actually keep you full with 16 grams of protein per serving! Between Thai and Mexican food, I’m not sure which wins my ultimate favorite award, but they’re both consistent front runners when it comes to the favorite cuisine race. The actual winner changes from day to day with tacos taking the lead spot last Saturday in the form of these tasty taco vegetarian lettuce wraps. As with many of my recipes, the idea for these tacos came from rummaging through the fridge, trying to figure out what to make for dinner. I had peppers, mushrooms, cilantro, and avocados that all had to go. I absent mindedly started adding tortillas to the grocery shopping list, but then I stopped myself. Although, unarguably delicious, tortillas don’t really add much nutritional value and are loaded with empty calories. Why not replace them with a veggie? I have made turkey taco lettuce wraps before, but wanted to go the vegetarian route with these. The beans provide plenty of protein and the quinoa is filling enough that you won’t even miss the meat. Given all this, there’s no reason to add it. When I first started dabbling in vegetarian dinners, I ate a ton of boca and meat substitutes. I’m surprised my husband married me after feeding him all that crap. We survived though. These days I shy away from prepared, packaged meat substitutes and prefer to make my own meat-less vegetarian filling. Its sooo much tastier and I love knowing what goes in it. So its exactly one week since I first made these vegetarian lettuce wrap wonders and I already want to make them again. I’m not sure if that shows a lack of creativity or just that they are super awesome. Maybe both. This last week has been a whirlwind of activity and I’m afraid that when things get too busy, my creativity seems to go on vacation and I go into auto-pilot mode. Last weekend was full of paddle boarding adventures (I’m a creature of habit) and getting things done around the house before my mother-in-law comes to town on Tuesday. I went to Paint-Nite with my little sis and a few friends this week. Other than that, I’ve been working my tooshie off trying to stay caught up at work. For years, I was a workaholic because for some sick reason… I liked it. I liked the feeling of accomplishment it gave me to work until midnight tackling analysis and reports like its a hobby. I loved being good at something, even if I didn’t necessarily enjoy the work that I was good at. These days, I just don’t have that drive. I value my personal time way too much to get enjoyment out of work travel, giving presentations, and taking on new projects. I kind of fell into consulting work early on and have had a pretty fast-tracked career since then. At some point, the allure faded and now I’ve got a high-pressure job, very little personal time, and a LOT of responsibility. My heart just isn’t in it and work doesn’t give me satisfaction like it used to. Probably why blogging has been so much fun for me. Creative outlets are clutch in maintaining sanity. Unfortunately, my work has accelerated to the point that I’m going to be working 60+ hour weeks for the next few months and spending a lot of nights in hotels (I’m scheduled to be traveling 3-4 days/ week almost every week August through October! FML!!!). I’m telling you this so that you know where I am since its inevitable that I will slack off on posting new recipes here and there while I’m going through this difficult period. I’m trying to stay positive, but it has been harder than ever to keep my chin up. Anyways – now that I’ve shared that tid-bit of negativity, back to talking about tacos. Given the constraints on my time, these vegetarian lettuce wraps fit the bill of a quick and easy weeknight dinner. Make them next week and let me know what you think! Rinse quinoa and add to pot. After quinoa has boiled for about 5 minutes, add corn cobs. Continue boiling for another 10 minutes until both quinoa and corn are fully cooked (if using frozen corn just hold off and add it with the peppers). Remove from heat and pull out corn cobs. Drain quinoa and set aside. Use a sharp knife to scrape the corn kernels off of the corn cobs. While quinoa and corn cook, melt coconut oil over high heat. Add onions and bell pepper and sauté until peppers start to brown. Add garlic and mushrooms and continue cooking until veggies are cooked and lightly browned. Stir in salt, chili powder, paprika, cumin, half of the chopped cilantro, and 1/4 cup salsa. Add quinoa and black beans. Stir and remove from heat. Serve veggie filling, grated cheese, additional salsa, cilantro, and avocado to lettuce wraps. Woohoo! 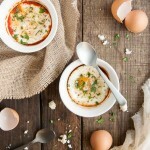 I’m a big fan of this recipe too! Is the nutrition info per lettuce wrap? Or for the whole recipe? There are six servings per recipe so the nutrition facts are for 1/6 of the recipe. Hi Margot – all of the nutrition info that I have calculated is shared in the nutrition label above. The approximate carb count is 47.8 grams per serving. I use a nutrition calculator for this so the actual amount might vary based on how you make the recipe (size of veggies used, actual portions, etc. ).